Alice teases another pot spread out from the central midden area. Sarah and her team prepare for the removal of the inner wall refacing on the south side of Structure Ten. It seems to have become traditional to begin with the weather, so we are happy to report that today has been stunning, with wall-to-wall sun and light breezes just sufficient to ruffle the hair of those diggers (male) who have hair. It won’t last, so here is the bad news. The weather forecast for tomorrow is execrable, with heavy rain (precipitation) and strong winds. Site director Nick has decided, therefore, to close the site for the day, as the experience of last week showed how dangerous the site can become in wet weather. The latter part of this afternoon has been spent preparing for the worst. A hive of activity as the baulk that contained the water pipe is removed. Black plastic sheets are being stretched over vulnerable areas, principally the floors, and the dreaded tyres have made an unwelcome reappearance to hold the whole thing down. As expected, the wind is also beginning to pick up. 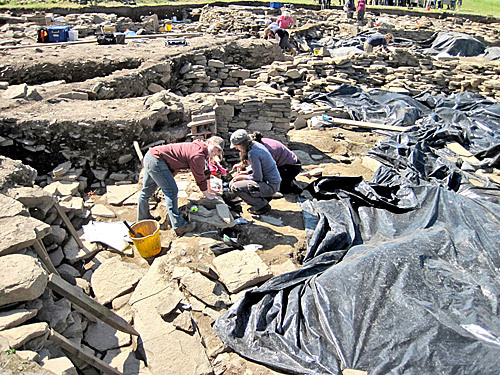 Seb and Tom were busy removing some of the late, rough slabs from the interior side of the north wall of Structure Twelve when, underneath a small slab, they found a deposit of fish bones. This is a rare find as evidence of fish consumption is often unusual in the Neolithic. Sometimes this is due to poor preservation conditions for such delicate items and sometimes it is because old excavations were just not careful enough to notice them. 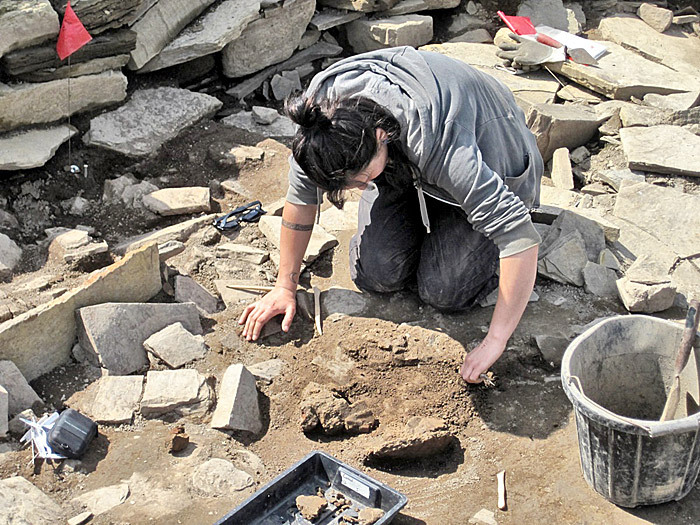 But at the Ness, excavation is meticulous and we have hardly half-a-dozen fishbone contexts thus far. Tom says the bones seem to come from herring-sized fish but our own fishbone expert, Dr Jen Harland, will analyse them and tell us everything there is to learn. The expression on Mike’s face says it all, as he unravels the robbing sequence of the outer walls of Structure Ten. Mike looks as if he has been ostracised, but we are not aware of him doing anything wrong. He is, however, hidden and invisible to the world in the sondage through the south side of Structure Ten. The clue to his fate is the thick bundle of papers on his knees. He is assessing the sequence of robbing events in that area and, from his expression, there seems to have been many of them. 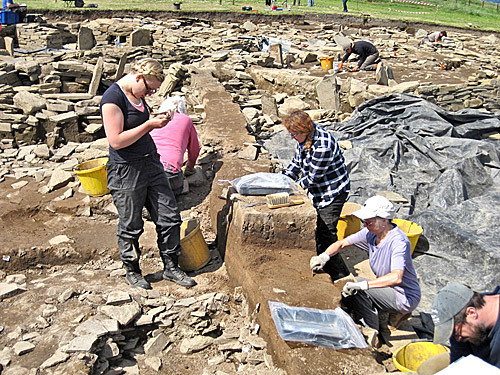 In what is left of the Central Midden Area, the last midden is disappearing quickly but Alice and Carin have been slowed by the appearance of large slabs of decorated pottery. Jan and Claire disprove the existance of a second entrance to Structure Ten — much to Nick’s delight! After long periods of head-scratching confusion, the area around the central standing stone is now being resolved by Owain and Chris. 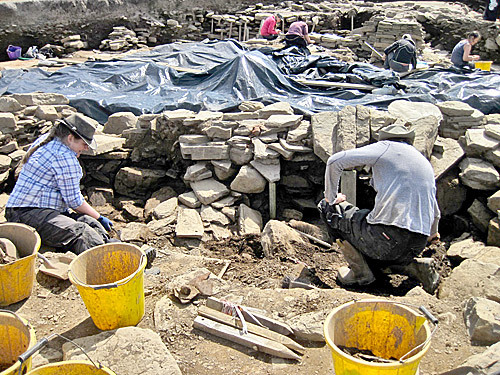 The secondary walls surrounding the stone are being removed and are revealing, as hoped, what is an extensive paved area between Structures One, Eight and Twelve, encompassing the standing stone. Structure Ten has seen further work on the northern stone-robbing area by Jan, Claire and Mark, but no sign of the suggested entrance there has been found. It is, it seems, just a big robbing hole. Also in Structure Ten, Sarah has explored floor deposits associated with the last remaining piece of the southern buttress/wall re-facing. To be honest, the diary does not fully understand this, but we are confident that Sarah does. We will be back on Monday. Have a good weekend. Alasdair seeks more amazing discoveries to the north of Structure One. 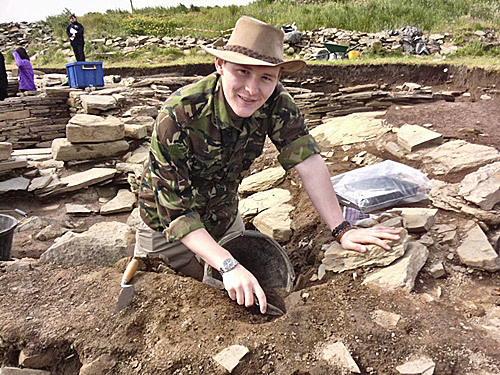 My name is Alasdair and I am just going in to my third year of BAH Scottish History and Archaeology with UHI in Perth. This is my first visit to the Ness. 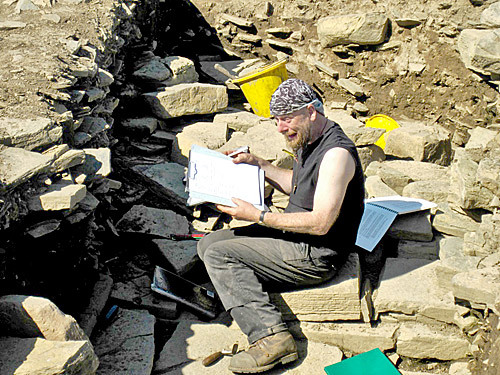 I am from Fife, so I have a relatively small distance to travel to Orkney compared to some of the other folk on site. I came to the Ness to complete my field school, which lasts two weeks, and time has flown over the first few days. When I first arrived on site, on Monday, it was a bit daunting as it is a massive project, but as I got into it, I felt at home. On the second day came a fantastic moment when I was working on the baulk, which the pipe that used to run through the centre of the site, sat on, near Structure One. I uncovered a fantastic piece of decorated pottery, which caused a buzz around the excavation as the experts haven’t seen anything like it before! Not bad considering that this was only my second day on site and this was my second ever find! I hope to find out much more about that piece of pottery as my time at the dig progresses. After the pot was removed from where I am working, I have been able to make much more progress down the baulk in the last couple of days and find other artefacts (sadly no more highly decorated Grooved Ware, but still interesting finds). Yesterday and today, I, and the other UHI field school students, was also learning about some of the survey techniques for the site, including context recording and the technological wizardry that allows us to record each find in 3D! I still get excited each morning before coming in as it seems that almost every rock you turn over produces new artefacts, some of which can hold huge implications for the interpretation of the site. I have been extremely lucky with what I have found so far and hopefully I’ll manage to keep that good luck (fingers crossed).